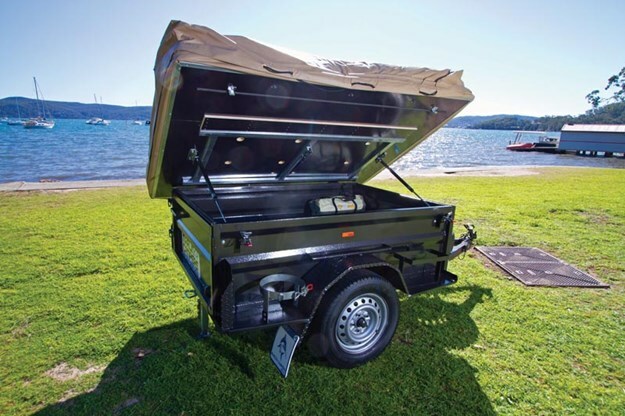 Camper trailers have come a long way in the past twenty years, evolving from basic pieces of camping gear – essentially box trailers with a tent attached into complex and sophisticated pieces of equipment driven by high tech digital monitoring systems with all manner of in-built comforts. It’s a long way from the old canvas tent, cut-down kero drum sink and sleeping-bags-on-bare-ground-camping that mum and dad introduced us to all those years ago. And in this rush of technology we can be easily dazzled by all the bright lights and shiny bits, both as consumers and reviewers. We forget the simple origins of the pastime and focus instead on the apex of this onward surge of evolution. In short we forget where we came from. But that’s not quite everyone. 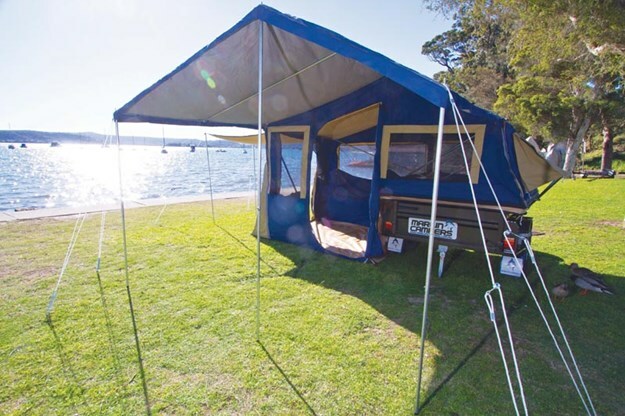 On the NSW Central Coast is a company that’s doing quite well, thank you, meeting those same basic needs that created this revolution in recreation that we call the camper trailer. The business is Marlin Campers. Marlin is a company that grew out of the energies and mindset of current owner Steve Brettoner, and a now long-gone partner, in 2007. The two were working for a Sydney caravan company that was also tapping into the then boom in camper trailer popularity. 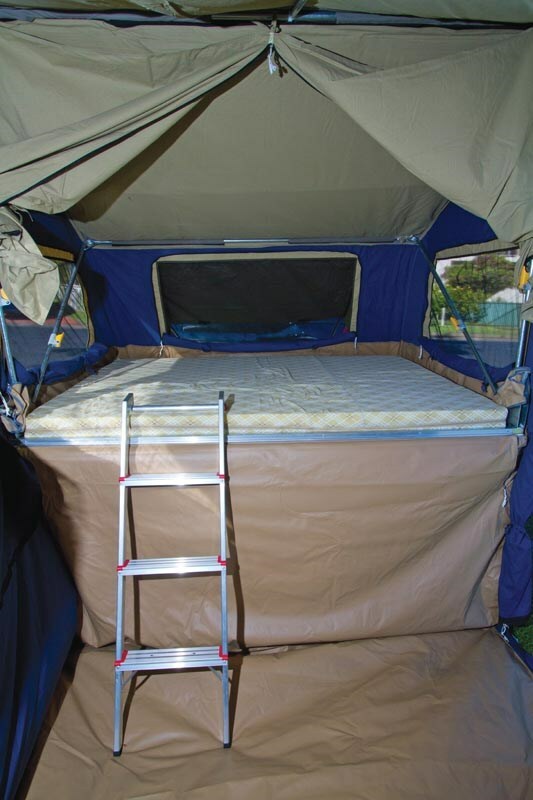 At the time there were three basic formats for camper trailers: Rearfold hardfloors, sidefold softfloors and pop-tops with pull-out end beds. Brettoner and his partner were in charge of the camper trailer side of the business with a small range of sidefold softfloors, since they were the easiest to produce. You simply bought a box trailer, attached a plywood base on top with a long piano hinge and mounted a tent on top of that. There was at the time a steady market for basic trailers such as this. Many customers had no taste for fancy features such as batteries, chargers, kitchens, lighting or water tanks. All people wanted were a couple of jerry can holders to drop in water storage, and a gas bottle ring so you could carry a supply for your portable gas stove or to run your three-way fridge when you got to your destination. Steve and his mate finished their weekend at the Sydney Caravan and Camping Show with an order book full of people’s names and addresses, and rolled up at work on the Monday morning only to find the gates locked by the bailiffs and no job to go to. What to do? It seemed their only long term option was to find new jobs, but they did have the order book full of people who wanted new campers, so it seemed a good idea to fulfil those orders, even though they’d lost the deposits which had disappeared into the liquidation of their ex-employer. So over the coming weeks the pair worked assiduously to get the campers together, using their combined knowledge of suppliers, and filled the orders, which brought in some badly needed funds. 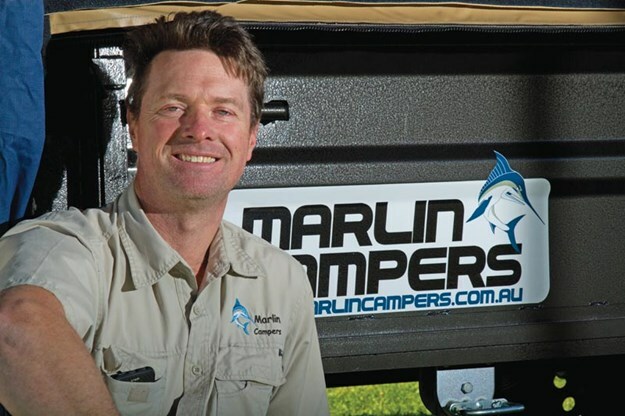 Over the following months they began to front up at other shows, using the name Marlin Campers, after a rugby union club Steve had been involved with at Coffs Harbour years before. They even pinched the logo. More orders flowed in. At the end of that first year they’d sold 300 campers and a new business had been born. Today Marlin Campers is thriving, on that same business model which launched the two enthusiasts 11 years ago (though now Steve is the sole owner after having bought out his partner who wanted to move on to fulfilling a desire to become a school teacher). Marlin makes basic, simple, millennium-generation camper trailers: Uncomplicated sidefold softfloor campers that are ideal launching pads for those who have a hankering to get into this pastime but do not have a budget for anything fancier, or who feel intimidated by the complexity of some campers they see, or who feel they don’t yet know what it is that they do want and so feel reluctant to be paying for stuff that they might feel they can live without. “As I see it there are three basic decisions our customers have to make,” Steve continued. “They need to decide how big a tent they need – which is determined by how many people are to be accommodated - whether they want to be solely onroad or have an offroad capability and whether they want to buy a base trailer, as we supply it standard, or whether they want extras or additional items built in. 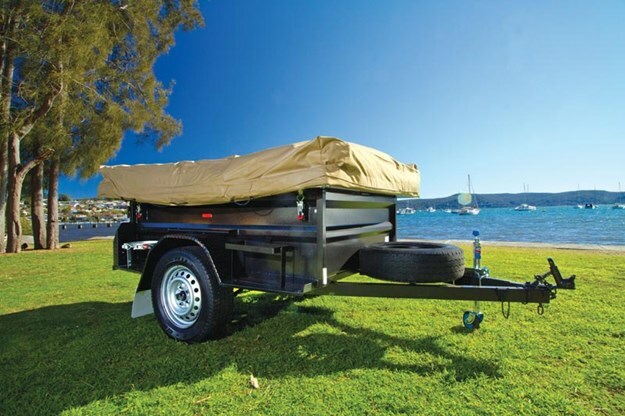 All Marlin’s trailer are built by Hunter Trailers, near Rutherford in NSW’s Hunter Valley. “The decision to go with Hunter Trailers was because I wanted a local manufacturer I could work with. I work closely with my trailer shop to make sure we are producing the best product we can. They need to continue to develop and improve the design of my trailers while keeping up with demand. This recent move also got us LED lights, a chequer plate floor, tie-down rails and seam welding all round for strength and to seal the interior from dust, water and other intrusions,” Steve explained. 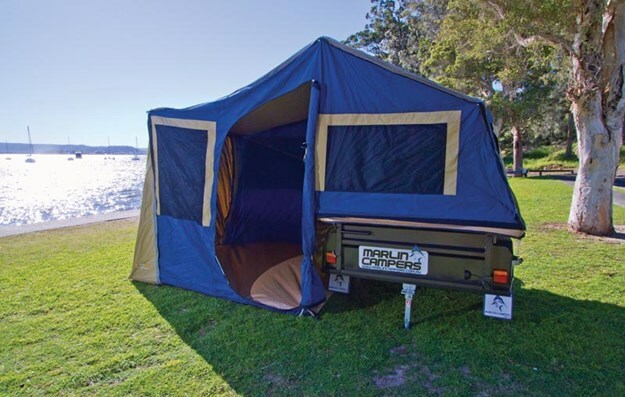 Marlin sells three models of sidefold softfloor camper: The Cruiser, the Escape and the Explorer. The Cruiser is essentially a 6 x 4ft box trailer, designed for single people or couples. It comes with what was known in the old days as a 6ft tent. It has a Tare of 300kg, so has a 450kg load capacity, as it does not come with brakes as in all Marlin’s trailers. It’s equipped with five-leaf slipper springs, swing-out tailgate, a 40mm round tube axle, 50mm ball coupling and a single stabiliser leg in the centre rear. The Cruiser’s chassis is angle steel with a 75 x 50mm drawbar. There is no jerry can holder or gas bottle ring unless ordered as options. While it is intended as an onroad camper it will live happily with a little light offroading over shortish distances to reach a camp spot or similar. The price in basic equipment format is $4000. The Escape is equipped with what was known in an earlier day as a 9ft tent and is intended for couples with one or two children who sleep externally in their own tent, and for longer trips because of its added storage volume. It has higher sides (540mm compared to the Cruiser’s 400mm). In basic form it has the five-leaf slipper spring suspension and round axle. It has a Tare of 360kg and so a load capacity of 390kg and sells in its basic format for $6000. The Escape served the role as model photographed for this article. The Explorer is marginally bigger in the tent, and comes with an optional kids’ room on a 7 x 4ft trailer. It also has the higher sides, along with a Tare of 410kg and sells for $6500. The offroad versions have a longer 100 x 50mm drawbar extending back to the front spring shackles. 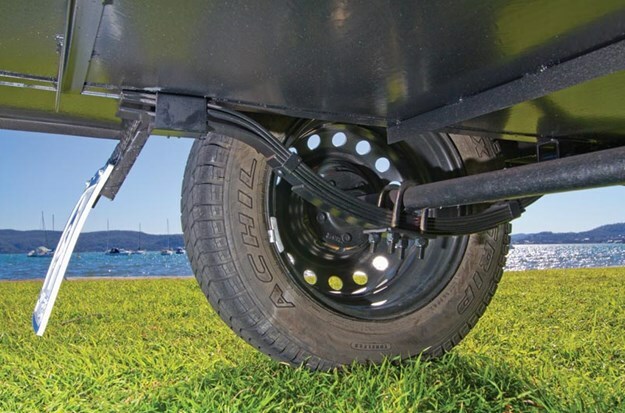 There is an Al-Ko five-leaf eye-to-eye suspension, a 40mm square axle, 16in six-stud wheels (which can be matched to your tow vehicle) with all-terrain tyres. This adds an extra 40-50kg to the camper’s Tare. Options can include a wide range of possibilities, from rebound spring sets, shock absorbers, polyblock offroad hitch, boat rack, power water pumps, extra jerry can and/or gas bottle holder, steel or ply kitchen, even a fridge (Evakool is the default option but others can be arranged) and, popularly, the new Deluxe Upgrade, which includes a Drifta ply kitchen, a 70L under-floor water tank, manual water pump, power pack with a 120Ah AGM battery, aluminium toolbox on an extended drawbar, a pole carrier and LED strip light. The individual components of the Deluxe Upgrade are available separately, but would add up to $3000 if purchased individually, but as a single install they are available for $2000 and make for a very workable little camper. They have even produced their campers with four separate legs to make it useable as a slide-on camper, as well as versions with independent suspension (though Steve dismisses this and points out that there isn’t a track in Australia that hasn’t had a leaf spring trailer dragged up it at some time, and the simplicity and repairability offset any gains). Marlin also manufactures a twin-axle version with a rear deck for carrying two motorcycles. Almost anything is possible. All of Marlin’s camper use Oztrail tents (the three models are the Camper 6, Venturer and the Zenith). 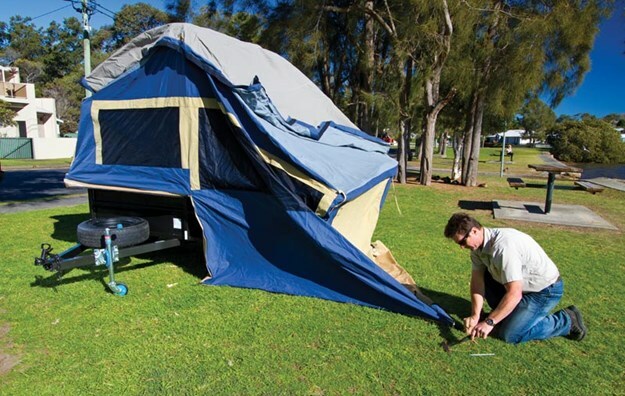 While everything else is locally made Steve feels he can’t beat the value for money on the Chinese-made tents, even though that prevents him claiming an all-Australian made sticker. “The guy who owns the company which makes the tents lives in Noosa, it’s just his factory is in China. Ninety percent of his work is done for Oztrail and they ensure that they are getting good value at the right price. 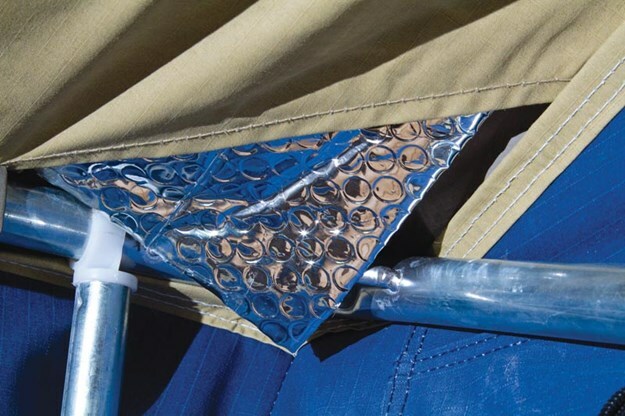 It’s all 12-ounce rip-stop canvas, and is soaked in waterproofing. The stitching is excellent and all the tents come with all walls and vinyl floor for the awning. The tents are remarkable easy to set-up. For an overnighter we timed Steve – who wasn’t rushing - taking just three minutes in very brisk wind. “Our market falls into one of three categories, or sometimes it’s a combination of all three,” Steve added. “There are those who don’t want to have to upgrade their vehicle, so want to keep things light and simple, and there aren’t many alternative choices today that can meet that desire. There are those who want simplicity of operation, who aren’t ready to buy all the upgrades just yet but want the option to do so later. And there are those who want ease of camping, and that involves not just the simplicity but the capacity, which we have, of being as quick as three minutes away from being able to hop into bed on an overnighter, if you don’t want to erect the awning. Cost is often a factor, but usually it’s the other desires which are driving their decision. “The biggest plus for me is when we get a customer who finds us at a show and seems so grateful because they were otherwise at the point of walking away and saying there’s nothing here for me. After all these years we’re still finding new people who tell us that they didn’t know that they could afford to do this. “I’ve always loved the outdoors and adventure and I love what I do. I’m not going to be a millionaire out of this, but it’s a great way to make a living. I go camping in our campers all the time, unfortunately usually just for weekends because so much of my time is taken up with shows and other activities. “This is the way I like to go camping; I feel like I’m camping with something like this. I like living outside; I like to cook on an open fire and that’s why I don’t have a kitchen in my own camper, because I don’t want to lose the space to it. I’ve been away in fancier campers but they seem to insulate me from the outdoors too much.